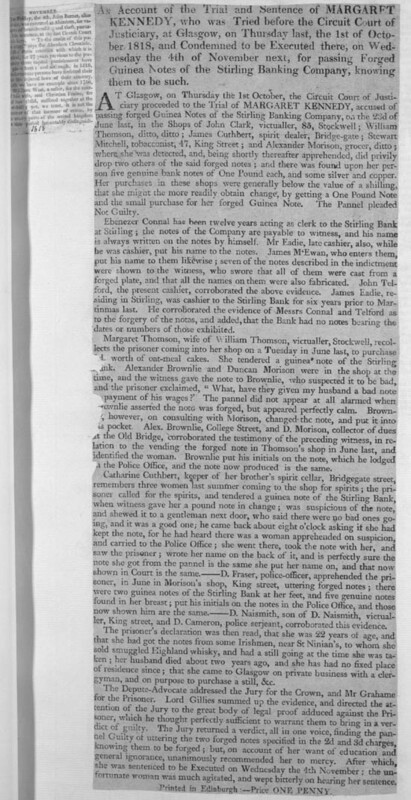 This report begins: 'An Account of the Trial and Sentence of MARGARET KENNEDY, who was tried before the Circuit Court of Justiciary, at Glasgow, on Thursday last, the 1st of October 1818, and Condemned to be Executed there, on Wednesday the 4th of November next, for passing Forged Guinea Notes of the Stirling Banking Company, knowing them to be such.' The name of the publisher is not included, though it was printed in Edinburgh and cost one penny. This broadside tells the tragic story of Margaret Kennedy, who was sentenced to death in 1818 for tendering counterfeit banknotes. The evidence against the poor woman was overwhelming, as a number of Glasgow shopkeepers appeared as witnesses to identify her as having purchased groceries in their shops with the forged notes. In mitigation, the defence pointed out that she was a young widow of no education who had become homeless following her husband?s death, and the jury recommended her to mercy. The judge, however, sentenced her to death.